+Comment Intel has ceremonially "shipped" its first Optane DIMM to Google, despite no Xeon CPU support. Navin Shenoy, exec veep and GM of Intel's Data Center Group, theatrically presented the kit, fresh off the production line, to Google platforms veep Bart Sano at Chipzilla's Santa Clara CA headquarters during its Data-Centric Innovation Summit on Wednesday. The carefully stage-managed event is all very well, but generally meaningless while Xeon SP (Skylake) processors don't support Optane DIMMs. Unless Google has customised Xeon processors, its Optane DIMMs are going to sit on a shelf. Despite this, Intel has been bigging up the performance benefits of Optane DIMMs. Running SAP HANA workloads on early Cascade Lake Xeons with Optane DIMMs apparently reduces restart times from tens of minutes to tens of seconds. Well, great. How often do you have to restart HANA? Basically we have little performance information about Optane DIMM-boosted applications because the production-class processors aren't even out there to use it. 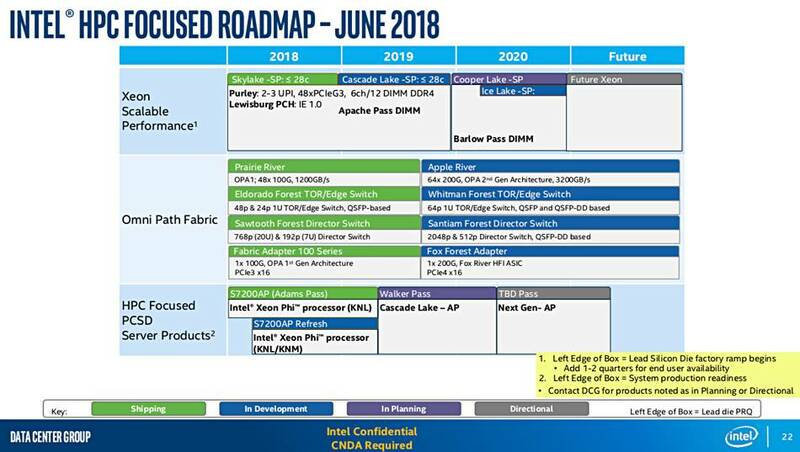 This slide shows the Apache Pass DIMM – Intel's code name for its Optane DIMM – shipping in 2019, along with the Cascade Lake Xeon processor. Cascade Lake is a 14nm process CPU, using the Xeon Skylake's Purley micro-architecture, which features AI-focused Deep Learning Boost (DLBOOST) tech intended to provide an 11x AI performance boost over Xeon Skylake. The slide also shows a Cooper Lake CPU, also using 14nm technology, with shipping starting at the end of 2019 and going through 2020, where it overlaps Ice Lake, Intel's long-delayed 10nm process CPU. A Barlow Pass DIMM is shown in 2020 in the Xeon SP table row as well. The slide's bottom row, labelled HPC focused PCSD Server products, shows a Walker Pass DIMM in 2019/2020 and a to-be-decided DIMM in 2020/2021. Walker Pass is timed with a Cascade Lake advanced processor. Our sister publication, The Next Platform, said Walker Pass is the "second generation Optane DIMM, and it looks like it is slated for around May 2019". Going by the slide's timing, Barlow Pass would actually be a third-gen Optane DIMM. We don't see Intel making it easy for AMD processors to support Optane DIMMs. However, now that Micron has separated its XPoint development from Intel's, that could indicate a route for AMD to support XPoint DIMMs, via Micron Quantx DIMMs if (and it's a big if) Micron produces them. It is clear that general Optane DIMM use has to wait for Intel's Cascade Lake Xeons. Even if Intel ships the first Cascade Lakes by the end of this year, it will be 2019 before server OEMs ship their products, and, most likely, not all Cascade Lake CPUs will support the DIMMs, with Intel rolling out specific variants with that support. Going by the missing product details – specifically read and write latency, power draw and endurance – we can be fairly confident that (a) current values are not excellent, and (b) Intel is still tuning its Optane DIMMs to get the latencies and power draw down and the endurance levels up. The Barlow Pass, Walker Pass and mystery DIMMs may well have higher layer counts, and hence capacities, than the current Apache Pass product.